Liven up your grain salad bowls with a punchy, smoky, ginger-tahini dressing and some rather interesting add ins – gorgeous dried golden berries, roasted eggplant and, um, the ubiquitous but awesome kale. A perfect phytonutrient-rich salad for now – and tomorrow’s lunch. Naturally vegan and gluten-free. Add roasted or boiled chickpeas, lentils or nuts to up the protein count. Tomorrow I have the pleasure of starting a new class at the cancer support centre where I work. And I am really looking forward to it. I love the planning and the shopping for new cooking and teaching opportunities, as well as donning my apron and actually practising what I am going to be preaching. The best job in the world: I lead nutrition workshops, as well as contribute to the teaching on another course, and see individuals too. But what I do a lot of is cook: three-course lunches every week for my own groups, as well as post-cancer treatment support groups. Because the group participants change every few weeks, I could legit get away with making the same things week in and week out. But frankly I would go out of my brain with boredom making the same recipes, with only the changing seasons offering creative respite. I quite admire restaurant chefs who can manage to cook a barely rotating menu day in and day out. It would drive me insane. To keep my sanity in check and satisfy my hyperactive brain, alongside about 10 rotating soupy staples that I can do with my eyes shut, I make different salads and cakes. To be honest they aren’t all winners, and like my late grandmother I have a bad habit of slating my food before anyone has had a chance to try it (“Oh, it’s not seasoned enough”; “I had to make this last night so the texture isn’t quite as it should be,” etc). Luckily everyone is always very kind and appreciative, and I in turn appreciate their enthusiasm for what is often a completely different eating experience. My schtick is to reassure everyone that what I serve them is perhaps an idealised version of – and my own personal take on – healthy eating. We aren’t expecting anyone to go home and make two or three salads, a soup, fruit plate, healthy dip and dessert for their own lunch. We just want to showcase the taste, beauty and nutritional advantages of “eating in colour” – which incidentally was going to be the name of this blog and why I started blogging in the first place. So, about the new class. A lovely group of ladies on a recent post-cancer treatment support course found that although they now felt pretty clued up about eating well after cancer, they were a bit overwhelmed. Enthusiastic about the benefits and possibilities that come from making positive lifestyle changes, but understandably nervous about putting it all into practice. As you can imagine, once someone has finished cancer treatment it is a bit scary to be “on your own”. It is even more daunting if one’s cancer is managed rather than cured. The post-treatment course is even titled, “Where Now?“. Part of my job is translating the burgeoning science on food and cancer into layman’s terms, but a big part is bringing it to life with plant-centred dishes – nutritious, balanced, colourful and seasonal. These enthusiastic foodies decided that they wanted to cook with me, and be shown how to keep their lunches from being boring and samey. 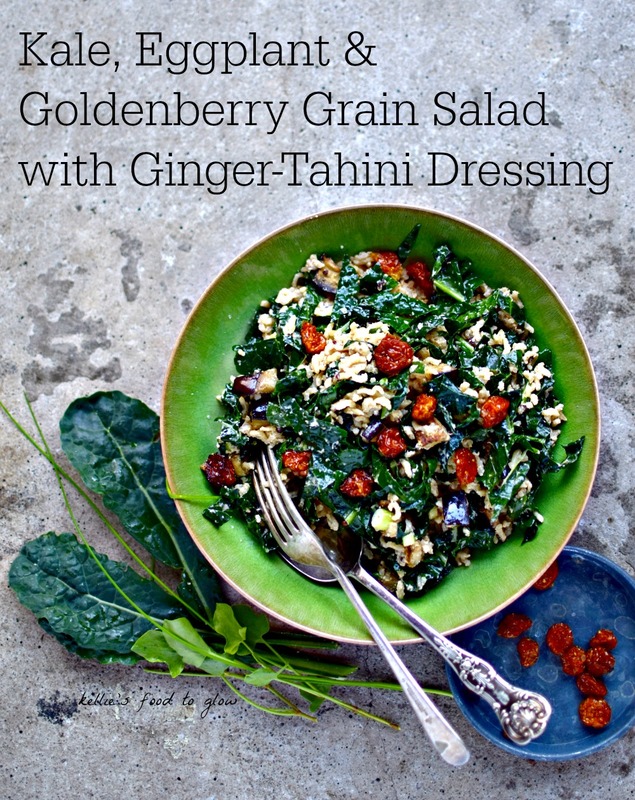 Liven up your grain salad bowls with a punchy, smokey ginger-tahini dressing and some rather interesting add ins – gorgeous dried golden berries*, roasted eggplant and, um, the ubiquitous but awesome kale. A perfect phytonutrient-rich salad for now – and tomorrow’s – lunch. Naturally vegan and gluten-free, too. Add roasted or boiled chickpeas, lentils, roast chicken or nuts to up the protein count. 1. Heat the oven to 180C/350. Take half of the oil and toss with the aubergine pieces in a shallow wide bowl. Lay on a baking tray and roast until lightly golden – about 18-20 minutes. 2. In the same bowl massage the kale ribbons with the remaining oil until softened. It will shrink in volume a bit. Add this to a serving bowl along with the quinoa and dried berries of choice. 3. In a jug or small steep-sided bowl, use a small whisk or fork to mix the tahini, lemon juice, red wine vinegar, gradually adding the hot water to thin. Stir in the ginger, smoked paprika, salt and pepper. If it doesn’t seem loose enough for a pourable dressing, slake with a little more lemon juice and water. 4. When the aubergines are done, stir them into the salad, pour over the dressing and toss well with your hands or two large forks. Sprinkle over fresh sorrel leaves and snipped chives, if using. Serve. * Dried golden berries are another name for dried physallis/Cape gooseberries – you know, the little fruits that look like paper lanterns. They are packed with iron, fibre and potassium. I love them! In the UK find them at Whole Foods, Waitrose, Holland & Barrett and Costco. Need more protein? Add toasted nuts, cooked chickpeas or lentils. Leftover roasted chicken would be a good option for non-vegetarians. PS I’m lucky enough to have space to grow a few edibles in my garden, including three varieties of kale. I used tender Cavolo Nero (black kale/dinosaur kale/lacinto/Tuscan kale) in this recipe, and it was soft enough not to de-rib nor massage. Here is a pic of how it stands up to winter frost. Not bad for January kale, is it? And some from my favourite bloggers! Kellie, This salad looks wonderful. I can’t wait to try it! Thanks for the ideas for using kale. Looking forward to tomorrow evening’s class. Bravo to you Kellie. You really inspire me and I’m sure your group too. Hadn’t heard of golden berries – will seek these out. 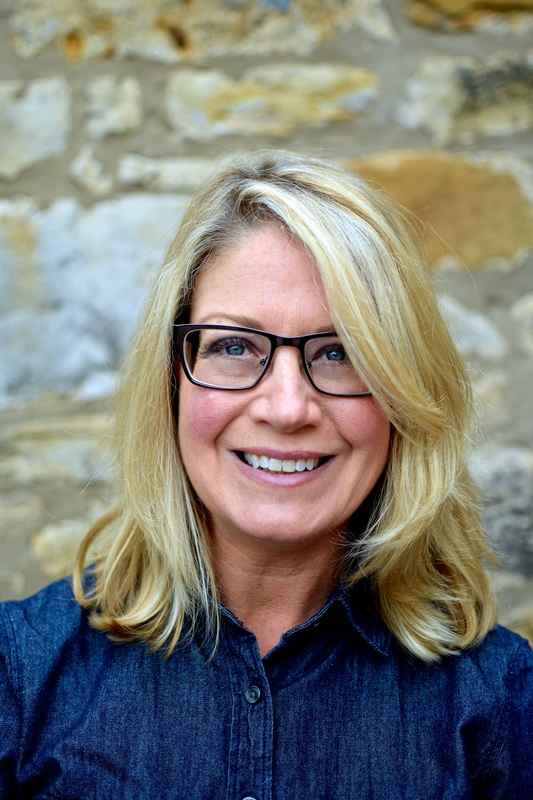 It’s so interesting to hear a little more about your professional work Kellie – a truly inspiring job marrying nutrition with food (we share the same dream!) I vary my menus a lot too, even through I know I make my life harder I just can’t bear too much repetition. This recipe is gorgeous – a great example of a versatile grain veggie bowl! A perfect summer salad Kellie! I hope all goes well today, I’m sure you’ll all have lots of fun. Thank you so much for featuring our cherry and quinoa salad. I’ve learnt something new again! (your blog is good for that 🙂 Ive never heard of dried golden berries before, I shall look out for them now, thank you! Leading nutrition workshops sound like so much fun! Congratulations on your amazing job 🙂 this salad also looks fabulous! I’d love to make it! ← Not-So-Classic Tabbouleh. But Near Enough.